Can I substitute instant yeast for the sourdough? If so, what adjustments to the other ingredients would I have to make? My Breadtopia oblong cloche can with instructions not to use it in a 500 degree oven. 475 was okay, but not any hotter. What is the Rubaud style of mixing? 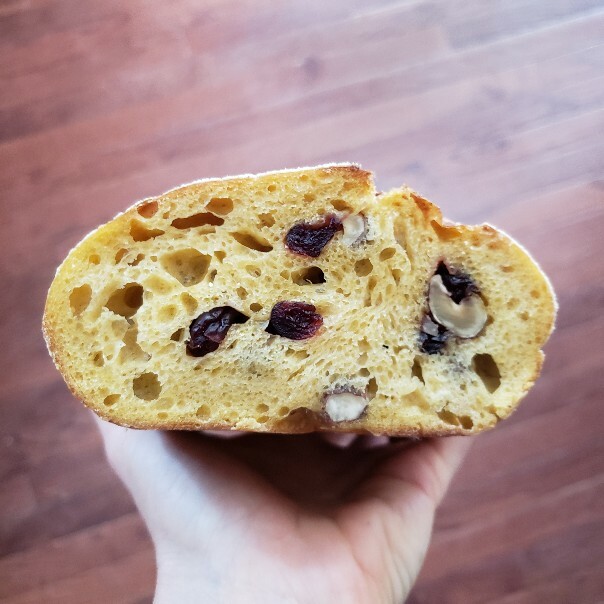 I’m going to go backward through your questions and give you a whole heap of math at the end that is basically unnecessary for this recipe (such small differences) but useful if you are interested in converting other recipes and understanding baker’s percentages. I’m happy to clarify anything that you have questions on. The product page for the clay baker in the Breadtopia store currently says 500F max. Maybe we’re looking at different pans? Perhaps @eric can chime in on max temp. I have two Breadtopia clay bakers and always preheat to 500. 1/4 tsp yeast is the typical substitute for 1/4 cup of active starter. 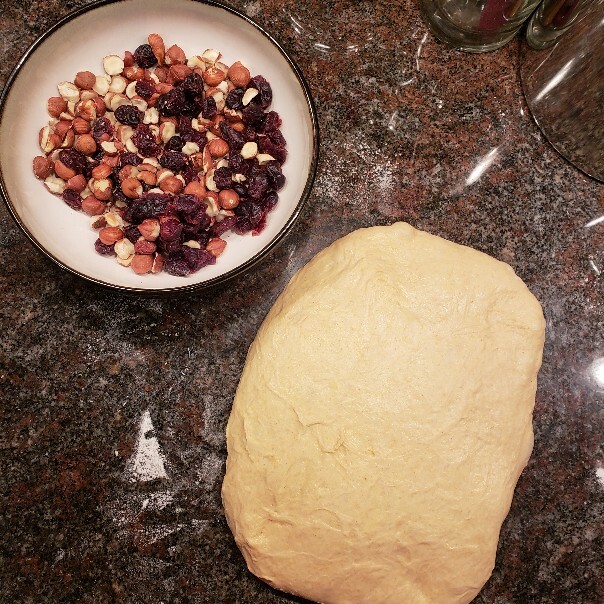 The timing could still be different so keep an eye on your dough much more than the clock. 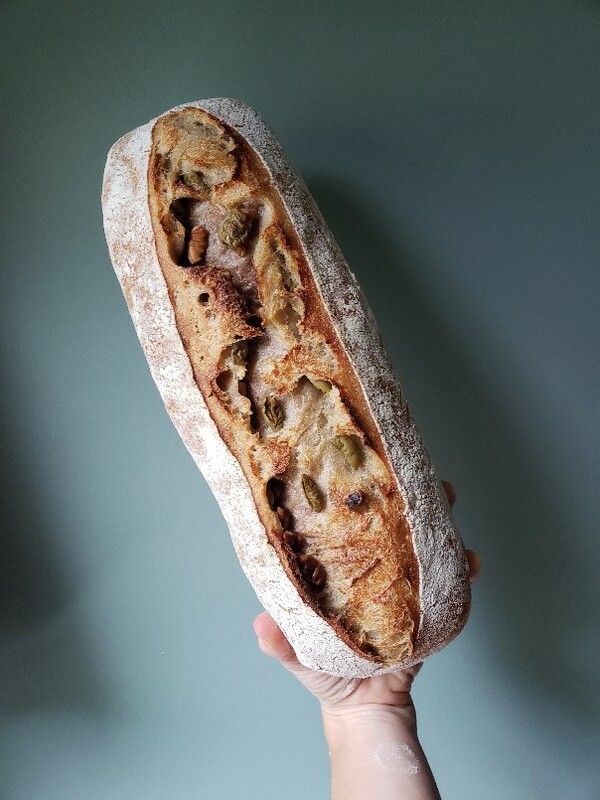 As for differing hydration, this recipe (unlike the ciabatta in the Rubaud video) doesn’t use a massive amount of starter, so you’re not losing much water by eliminating the starter. You can do the same with the 8g salt but again not really necessary. Google will get you to cups and tablespoons if you’re not using weight e.g. 1 cup water is 236.59g water though I’m pretty sure I’m not that precise in volume or weight of ingredients! This looks great. Can you tell me what substitutions I would make to use regular hard red wheat instead of sprouted? Thanks! I wouldn’t change any of the other ingredients because you’re substituting regular flour for the sprouted. Your bulk fermentation and proofing times may be a little different, but the suggested timeframes are always variable and depend on your particular environment and starter anyway. Enjoy! I should have noted that if you’re using whole grain hard red vs bolted hard red, the doughs feel a little different at the same hydration. Whole grain feeling dryer/being more thirsty. Someday I should experiment to find out the h2o percentage-point spread for the same hydration “feel” of whole grain vs. bolted vs. white. It would be different for each wheat type and for each milling scenario. A doozy of a project as I’d insist on baking all the comparison doughs! I’ve had a good experience adding nuts and dried fruit and olives to the dough after the bench rest, and wanted to share the technique that is working for me for this shape. 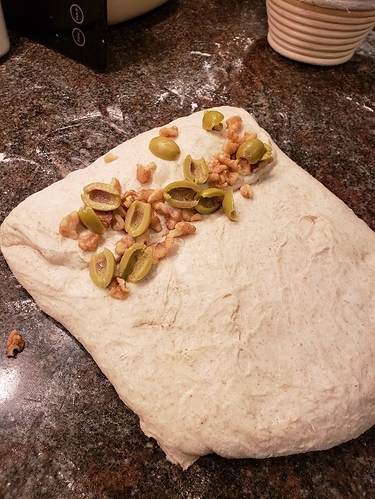 After the dough is stretched into a rectangle, sprinkle a line of additions along the top and fold the dough over it, then sprinkle more additions on that seam, and roll the dough over on top of it, and at least one more time: a line of additions and roll the dough over on top of it. Pinch closed the ends. It’s almost like a cinnamon roll. This recipe was really fun. Thank you for all the information. I baked a really nice loaf of this bread after purchasing the flour and oblong cloche and proofing basket. (Incidentally this new cloche handled 500 degrees fine for me) I did the 1 1/2 hour proofing method on this first loaf. Excellent oven spring. My next loaf tomorrow I’ll try the 10 to 12 hour proof in the fridge. I was curious if the loaf, upon completion of the proof, can go directly into the oven or should I let it rest first bringing it up closer to room temperature? Thanks in advance. I’ve had no problem with cold loaves directly into the baker. I’m glad you’re enjoying the recipe and your new cloche. 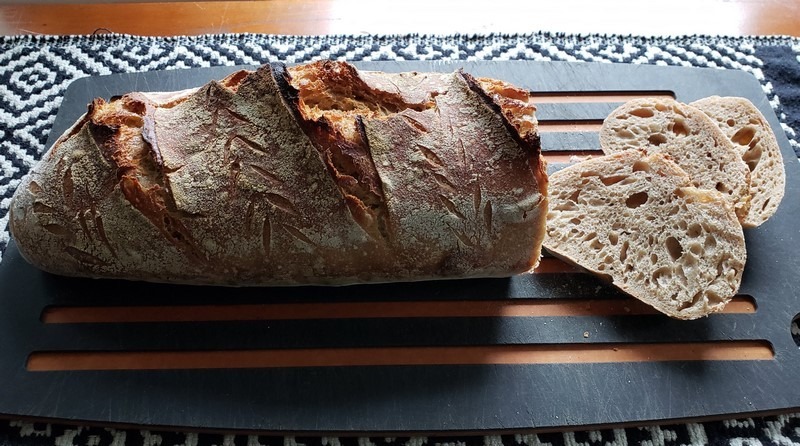 I was wanting to make some whole wheat sourdough sandwich loaves and since I had a bag of King Arthur sprouted wheat flour I tried this recipe. The loaves turned out really tasty but fairly dense and a tad on the dry side. I did weigh the ingredients, but I think my dough was still quite a bit drier than what was in the pictures. It wasn’t a bolted flour, so that was probably a factor, but I’m wondering how much weather and air humidity effects flour. It’s been in the single digits here in Idaho Falls with extremely low humidity. Is there a “rule of thumb” for increasing or decreasing the liquid in a bread dough depending on the humidity, or does it really matter that much? I also don’t have an oblong covered baker so they were just baked in a normal loaf pan. The issue is most likely bolted vs whole grain. The more bran, the thirstier the dough. 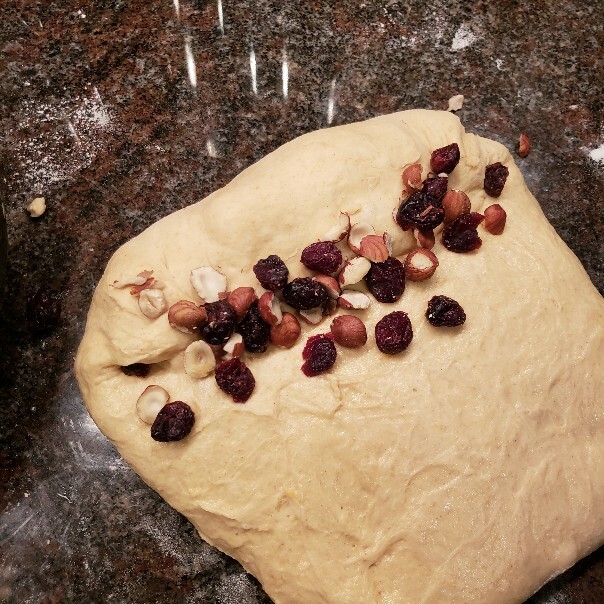 I’m not sure about humidity and hydration but the more experience you get with X dough-feel = Y bread-results, the better you’ll be able to add water as needed. Just curious, what was the total bulk fermentation time, including the stretch & fold period? 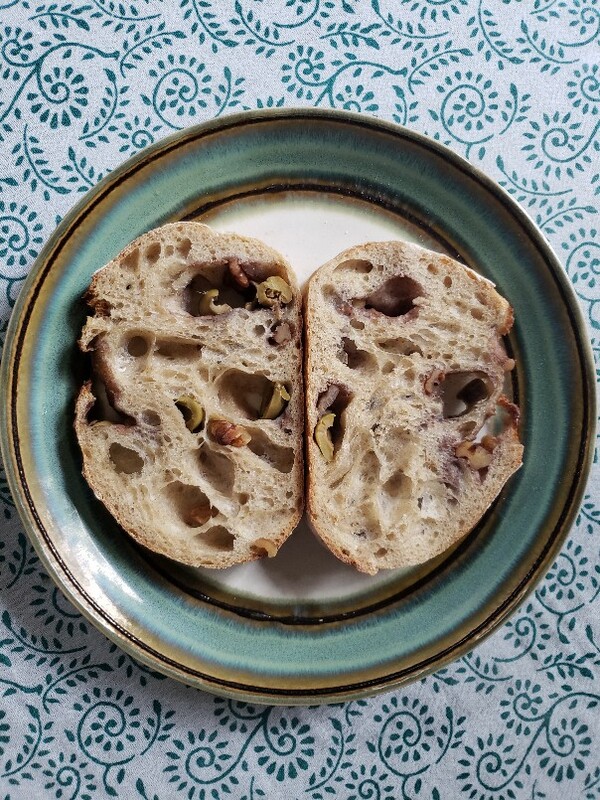 And is there any problem with putting sprouted wheat dough into the fridge overnight (after a few hours of mix, rest, and multiple S&Fs) to proof and bake in the a.m.? I have some sprouted red fife I want to bake with (non-bolted), but haven’t used sprouted flour before.